8173 Windy Oak Ln, Verona, WI.| MLS# 1849305 | John Reuter Realtor/Broker/Owner of The Reuter Team. Wisconsin Homes for Heroes Realtor. Proud to be the Top Homes for Heroes Realtors in Wisconsin and One the Top Homes for Heroes Realtors in the United States. 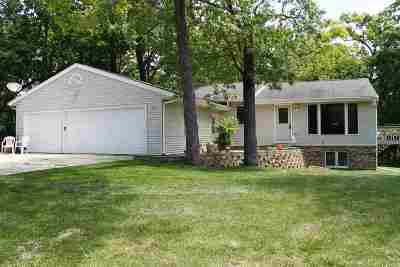 One of 4 homes on this rural cul-de-sac hidden back on a 1.46 acre wooded lot conveniently located between Verona(3 miles W of Epic)& Mt Horeb. Extensive remodel in 2001 features Pella windows, fantastic kitchen w/ Maple floors & Cherry cabinets, siding & baths. Living rm has Cozy brick hearth wood burning fireplace & new carpet. Amazing walkout LL family room accented by fabulous wet bar area. Huge 3 car garage w/ stairs to LL laundry/storage/exercise room. Enjoy the outdoors on either the deck from dining area or patio area out back. Lower township taxes. New water heater & improved attic to R55 Jan 2019.